Chris is currently a Senior Economist in the International Climate Change Division in the Department of Energy and Climate Change, where he leads on economic analysis on targets and technology. Chris joined the Government Economic Service in 2001 and has since worked in Her Majesty’s Revenue and Customs on environmental taxation and the Department for Environment Food and Rural Affairs in a Climate Change team focusing on the G8 and other international climate change issues. In November 2005, he joined the Stern Review, where he was the lead author on the chapters covering technology policy, international technology cooperation, and supporting the transition to a low-carbon economy in developing countries. He helped disseminate the findings of the review and respond to commentaries on the Review. 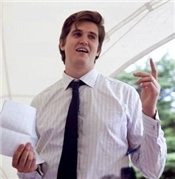 Chris studied a BSc in Economics at Nottingham University and an MSc in Public Policy, focusing on environmental economics, at University College London. Equity dimensions of mitigation action.